Art cars and futuristic Vikings all arrived in an empty parking lot in the Junction last weekend. The fire-breathing dragon at Metaverse 002 on July 23, 2017. All photos by Maria Calleja. Somewhere in the Lower Junction amid industrial buildings is a wide open space covered with gravel. It’s used rarely, only for a few farmers markets, and will likely turn into more condos or offices in the future. But Sunday, July 23, the space was transformed by Torontonians dressed in faux fur, Viking hats, black leather, and body paint. The event was Metaverse 002 and it brought together city dwellers hoping to get a taste of the culture that has developed at the Burning Man Festival, which takes place in the Black Rock Desert in Nevada every year. To recreate the Burning Man atmosphere, the organizer, Kevin Bracken, and designer Marie Poliak lead a 150-person team with five licensed pyrotechnicians to weld and solder together a metal dragon built on a small bus. 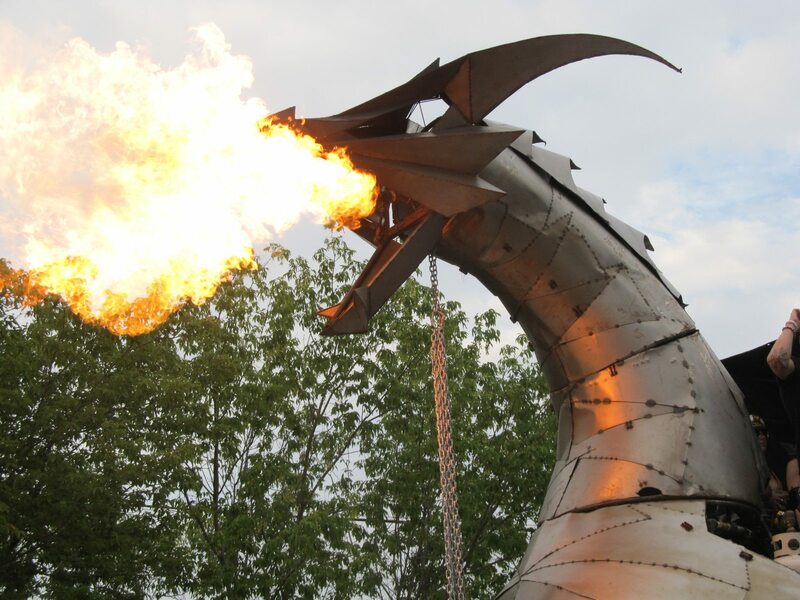 The dragon is 19 feet tall, with an animatronic mouth that breaths bursts of hot flames. Burning Man has a tradition of making Art Cars, wildly inventive cars. That tradition inspired Bracken and Poliak to make their giant dragon. Some Burning Man Art Cars feature large sharks and futuristic Mad Max–style desert vehicles. Bracken and Poliak plan to support the creation of 10 art cars in the next several years with the goal of hosting block parties and entire festivals. These weird and wonderful creations at events like Metaverse 002 and Burning Man can seem like a world away from your day-to-day grind. “That culture, creating art, creating experiences, breaking yourself from the shackles of everyday life, [you’re] experiencing these new ways of interacting with people around you and taking that to your city,” Poliak said. Attendees at Metaverse 002 dressed according to the “future Viking” theme. The Burning Man culture of art and self-expression is apparent here, with an artist painting his own dragon on a large canvas amongst the dancers. Another woman who does body art at Burning Man paints designs on people with long colourful brush strokes. Later, fire dancers balance burning batons and twirl them on their heads, brushing them quite near to their bodies. Further on in the evening, there is also a light and laser show by Lumatronic and circus acts by Zel Tyrant. Musicians and DJs at the event include Hatiras, a two time Juno nominee; Ben Cormier, who is a part of the DJ collective Dirty Decibels; and MRKG, SIERRA, and Steintology, who are a part of Secret Society, a group of DJs that include Matt Von Wilde. The dragon sat at the back of the open space and can hold 10 or so people on its top platform, where DJ Matt Von Wilde was spinning some electronic beats. A crowd gathered around the dragon, waiting for the intermittent fire. Most of the onlookers were dressed to match the “Future Viking” theme, which gives the event its postapocalyptic atmosphere. “Burning Man is not a spectator sport. It encourages you to participate. That is what we are trying to achieve by getting people to dress up,” Poliak said. 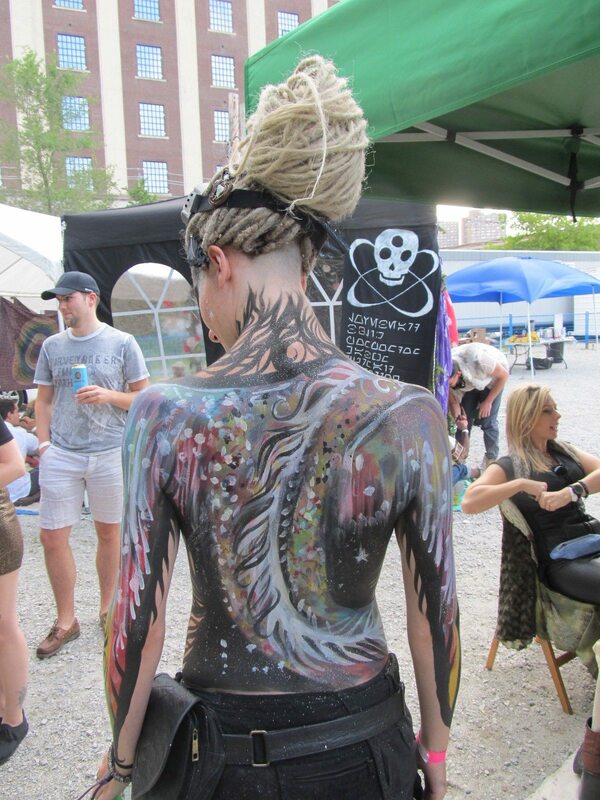 Body painting at Metaverse 002. Neville Alexander came dressed in what looks to be a flashy Hermes costume complete with the winged hat and sword. “It is fun to dress up. I wore this costume to the hospital and everyone smiled,” he said. Bracken and Poliak hope to take the dragon art car to other festivals. “It’s a Toronto project that is going to Burning Man to show off a local stage. Ultimately it is for our city to inspire our city to do crazy things like this,” Poliak said. Next, the dragon is off to Detroit for the Maker Fair, which gathers artists and DIY craftspeople. Later in the summer, they plan to drop in the Burning Man Festival itself to represent Toronto and visit the site of their inspiration. They plan to post their adventures on their social media feeds as they travel.